I Buy Way Too Many Records Dot Com: V/A - TOTY Split Series #1 7"
V/A - TOTY Split Series #1 7"
I haven't bought many records lately. I recently moved into my first house and money is a bit tighter than usual. There's only been a few sporadic new things coming in over the last few weeks. But as I dig around to find records to write about on this website, it's amazing how much of a backlog I have of Japanese CDs and 7"s that I haven't gotten to yet. Some are still from my trip to Japan nearly two years ago and others are from various mailorder acquisitions since then. The point is, I'm not running out of things to write about anytime soon. This compilations 7" features two songs each from three different Japanese bands. On the record, they're arranged kind of haphazardly, but for the sake of this review, I'll write about each band's songs together. Summer Months gives us "Before We Fall Asleep" and "Nothing." "Before We Fall Asleep" is slower and reminds me a little bit of Boys Life. They have the mid 90s midwestern vibe down pat while still keeping the chorus upbeat and catchy. "Nothing" is a shorter, faster burst of energy. Not as intricate as "Before.."is, but it's even catchier. I was already familiar with the band Bows before I got this 7" and if I'm being truthful, they're the main reason I picked it up. Their two songs are just what I've come to expect from this incredible band. They have the I Excuse/Manifesto Jukebox version of dynamic punk rock perfected and both "Other Town, Other Light" and "Time Waits For No One" showcase wild guitar noise channelled into hooky choruses. One of the more overlooked bands out there right now. Finally we have Gremlin. 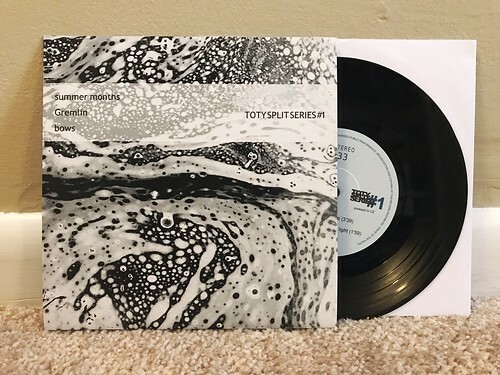 Like Summer Months, I hadn't heard of them prior to picking up this 7". I should have expected yet another pretty great band. Really, no one does pop punk better than all of these great bands from Japan. Gremlin manage to fit right in with the other two bands on this compilation, while still sounding completely unique. They have some similar elements that you can hear in Bows and Summer Months, going back and forth between fuzzy guitar chords and jangly guitar leads. However, the way the structure these parts into their two great songs stand out as being different. Scaries - Missing You 7"
Ruler - Jeanie Jeanie Jeanie 7"